While renowned for its gorgeous beaches, the majestic island of Maui is also known as one of the most beautiful places on earth because of its unique geographic features. What do we mean? Well, as you drive along the coast, you see a stunning ocean on one side and impressive mountains standing regally on the other. The striking beauty of these opposing landscapes is truly breathtaking. And these divergent geo-features are what create a multitude of distinct microclimates that can best be seen on our Maui sunrise volcano tour of Haleakalā. Only on this bike tour will you get to experience the full range of climates that make up Maui as you start at the top of the Haleakalā volcano and ride all the way down to the sea. But are these climates that diverse? What are some of the different microclimates you bike through on the Maui sunrise volcano tour? A volcanic desert retreat. 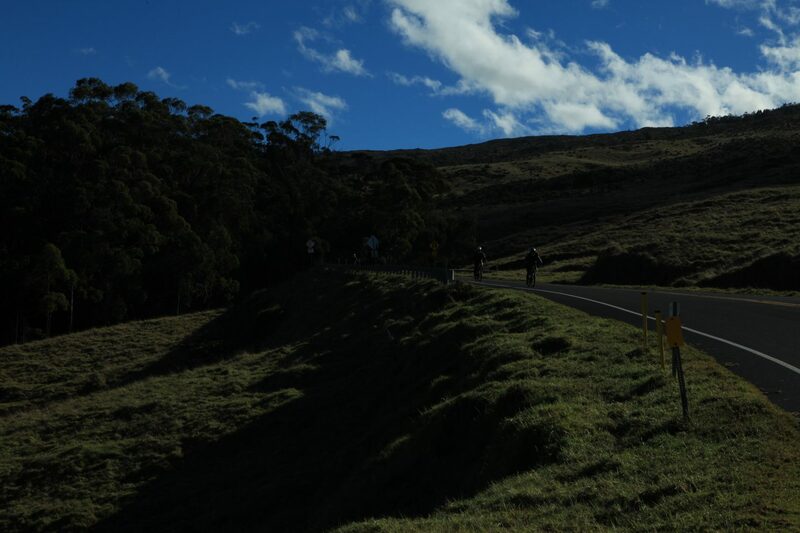 On the sunrise bike tour, you will be driven up to the summit of the Haleakalā volcano, which sits at an elevation of 10,023. There, above the clouds, you’ll watch the sun come up over the distinctive cinder landscape of the dormant volcano. At this elevation and with clear skies, the weather often offers excellent viewing conditions but is also windy and can get pretty cold at sunrise with the dry desert air. From here, you can also see the crater of the volcano, an eroded volcanic depression that is 7 miles long, 2 miles wide, and 2,600 ft. deep and containing many brown and red volcanic cones from past eruptions. This richly-colored volcanic landscape seems like an alien planet compared to the lush tropical vegetation at sea level. Visitors can take a hiking trail through this cinder desert and see many rare species of animals and plants found only in this unique climate. As you travel to lower elevations on the Maui sunrise volcano tour, you’ll transition into slightly different microclimates, more lush as you bike down, each with slightly different plant-life and weather conditions. Flower farms, tropical gardens and rolling hillsides. Although still in the cooler mountain air of Upcountry, the area around the town of Kula is teaming with beautiful gardens and even farms of exotic flowers like protea, carnations, lavender, and other tropical flora. At an elevation of about 3,200 feet, Kula Lodge and Restaurant offers breathtaking views of surrounding mountains and the Pacific Ocean. Kula means “open country” in Hawaiian and aptly describes how the climate and vegetation shifts slightly in this area to a more open-air, dry, rural country set amid rolling green hillsides and offers the perfect climate and soil for farming. Old sugar plantation areas. Further down the mountain sits a flat-lying area where acres of sugar cane fields once flourished. This tropical farming area sits closer to sea level and once helped to make Paia a bustling plantation town. Sea level. Finally, you reach Paia Town and the ocean. As you end your Maui sunrise bike tour, you return to the warm ocean climate that most people think of when picturing Maui. This charming town is the heart of the North Shore and boasts some of Maui’s most beautiful white sand beaches. The diverse microclimates you’ll not only see but also get to explore on the Maui sunrise volcano tour create a truly one-of-a-kind experience. From starting at the dry volcanic landscape of the Haleakalā Crater, then moving down to lush tropical gardens featured on the winding roadway of the mountain to the open-air pastureland settled on hillsides near Kula and finally back to the ocean, the amount of climate change you’ll experience is incredible. And all of this you can see in just under 2 hours (that is if you don’t stop to take in the sights, but we suggest you do stop along the way on our self-paced tour). Nowhere else can you experience the distinctive array of landscapes and climates that are collectively known as Upcountry Maui.